Balabolka is a Text-To-Speech (TTS) software tool. All computer voices installed on your system are available to Balabolka. 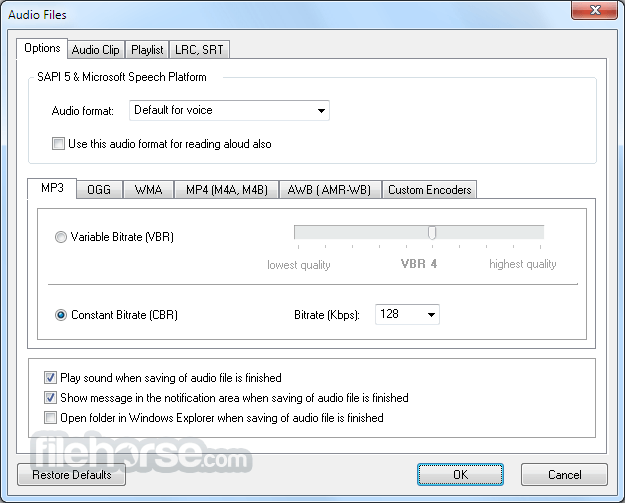 The on-screen text can be saved as a WAV, MP3, MP4, OGG or WMA file. The program can read the clipboard content, view text from documents, customize font and background colour, control reading from the system tray or by the global hotkeys. It supports text file formats: AZW, AZW3, CHM, DjVu, DOC, DOCX, EML, EPUB, FB2, FB3, HTML, LIT, MOBI, ODP, ODS, ODT, PDB, PRC, PDF, PPT, PPTX, RTF, TCR, WPD, XLS, XLSX. 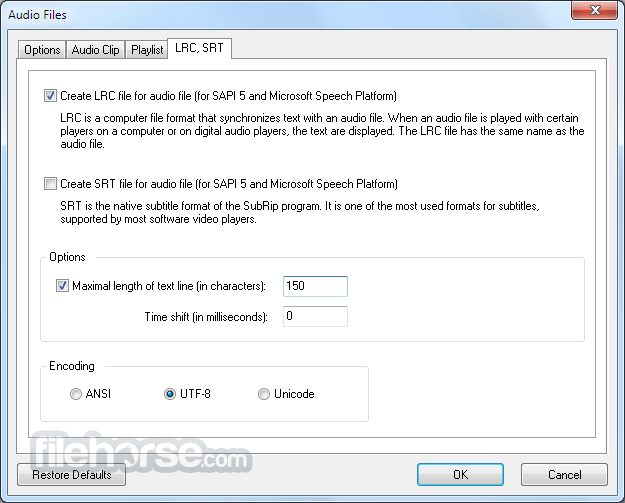 The Speech API (SAPI) is an application programming interface developed by Microsoft to allow the use of speech synthesis within Windows applications. The SAPI provides a high-level interface between an application and speech engines. 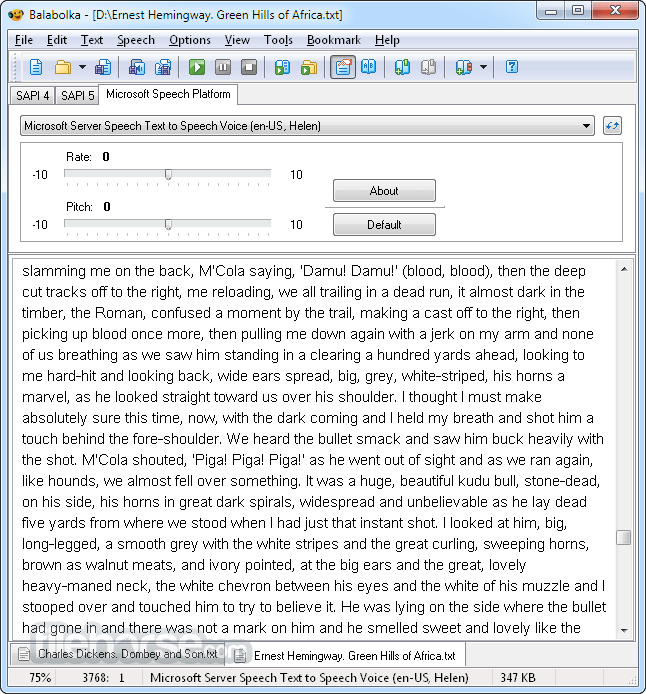 Text-To-Speech software synthesizes text strings and files into spoken audio using synthetic voices. In Google Translate you can find a "Listen" button that converts text to speech. After pressing of this button a browser starts to download MP3 file. The service supports converting to speech texts not longer than 100 symbols. It allows to divide big text on small parts, create an audio file for each part and merge them together (WAV, MP3 and OGG formats are supported). How can I make a silent installation of Balabolka? To install the program in silent mode without dialogs you may use a silent installation. A silent installation is available by using -silent command-line switch. I open a DjVu file, but the program doesn't show any text. What is wrong? DjVu format was designed to store scanned documents. A DjVu file contains images of pages for books, magazines, etc. Also, DjVu can contain an OCR text layer. It can extract data from a text layer of DjVu only. If such layer is not available, the only way to get text is to use a text recognition system (for example, FineReader). How can every line of a text file be converted to a separate audio file? You may add two empty lines after every line with text in the document. Open the file in Balabolka, choose the main menu item "Edit | Replace", type ^p in the Find what box and ^p^p^p in the Replace with box, click the Replace all button. Choose the main menu item "File | Split and Convert to Audio Files"; choose the split method "by two empty lines in succession" and click the Split and Convert button. Spritz is a a new speed-reading technology. It allows to speed reading rates anywhere from 100 to 1000 words per minute. The time consuming part of usual reading lies mainly in the actual eye movements from word to word and sentence to sentence. Spritz positions words in a spot on a display where you can recognize the word, without moving your eyes.